During the full or waxing Moon carefully gather fragrant rose petals. Pour the honey in and stir gently until all the petals are well coated. Fill the jar to the top with the vodka and stir gently to release any air bubbles. Put the lid on the jar and shake to finish the mixing process. 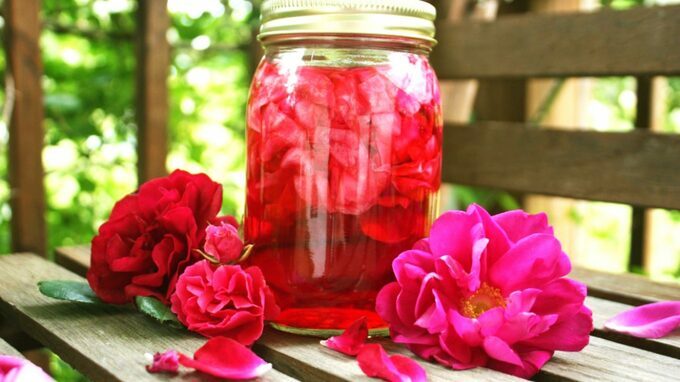 Place in a cool dark place for one Moon cycle (four weeks) then strain, bottle and label your Honey Rose Elixir. Honey Rose Elixir can be used in place of wine in your Altar chalice and is a most magickal offering to all love Gods and Goddesses. Honey Rose Elixir is drinkable magick! Use it to reinforce love and healing spells, and to ease a broken heart, depression, anxiety or grief.